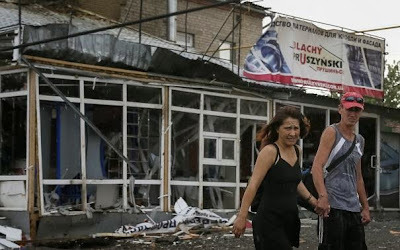 SLAVYANSK Ukraine -- When the daily shelling starts in this besieged city in eastern Ukraine, those who have not yet fled the fighting grab their children and head underground. Local residents, in Slavyansk, pass a destroyed house. If there is time before running into cellars and basements, the people of Slavyansk gather chairs, clothes, water and other provisions for stays that can last for hours or, sometimes, all night. "We live in our cellar," said Svetlana Dobrostroy, who has a six-year-old daughter and a son aged 10. "The kids get very scared. They know it's a war. They're the first to run to the cellar." About half the 130,000 residents of Slavyansk are thought to have fled since fighters who want eastern Ukraine incorporated into Russia took control of the city in April, a month after Moscow annexed the Black Sea peninsula of Crimea. Since then, government forces trying to end the rebellion in towns and cities across the Russian-speaking region have pounded separatist positions in and around Slavyansk. Despite the growing danger and privation, many families with children have remained, either out of choice or because they believe they do not have the funds to get by elsewhere. Dobrostroy has had no income since the dairy factory where she worked closed at the start of the fighting, and worries about what would become of her children in an unfamiliar place. "I have no money at all", the 29-year-old said, adding that her rainy-day fund was now just 20 hryvnia ($1.70). "I have no relatives, I'm absolutely alone. I can't go anywhere. Somewhere else, people may not like my children - how they walk, sleep, eat, speak, play." "I have my blind, diabetic mother here and my grandmother, who is almost 90," she said. "How can I go anywhere? How can I leave my grandma here? She would die on the way if I took her anywhere else." Since the city's takeover by the rebels, who oppose Kiev's pro-Western government, most adults have either lost their jobs or been deprived of access to the pensions or other benefits they would usually receive. There is no electricity in most of the buildings. There is still clean water but it cannot be pumped through the city without electricity and every morning residents stand in lines with cans and bottles at the filter station. "In two and a half months, our city has turned into a ghost town", said Marina Oleynik, head of a municipal social services center for families and children. She cited unofficial data suggesting half the population had fled Slavyansk. "A month ago there were about 4,000 children still in the city," she said. "Now, of course, no statistics are available." Her center was formally shut down last month, when the city authorities ran out of money, but Oleynik still tries to help evacuate people who want to leave. Ukraine and Russia have set up refugee centers for people who flee the fighting, including families from Slavyansk, which sits on a strategic highway. Some refugees have also found shelter in hostels on the Black Sea coast or in tented camps. According to the United Nations refugee agency, about 110,000 Ukrainians have left their homes in the east and fled to Russia and 54,000 have been displaced within the country. Most of them stay with relatives or friends. The dangers of staying are never far away, for children as well as adults. A 30-year-old who gave her name only as Olga said she had nowhere to take her five-year-old son, Yaroslav, and had received no income since the closure of the advertising firm where she worked before the fighting began. There was panic in her eyes when a thunderous explosion echoed around the central square where she stood one day this week and she hastily looked for somewhere to take shelter. She said she could not afford to move anywhere else and had turned back several times after starting to flee the city. "Yarik has already got used to it," she said of her son. "But when we go back he asks: 'Mum, why we are going where they shoot'?" "Are you scared when they shoot?" she asked the boy. A 10-day ceasefire has failed to halt the fighting around Slavyansk and since it expired on Monday the gaps between mortar blasts have rarely lasted more than a few hours. It is unclear how many civilians have been among the hundreds of people killed in three months of fighting across eastern Ukraine. A battle that marked the formal end of the ceasefire was so fierce that the television relay tower on the outskirts of Slavyansk collapsed when it came under fire. Mortars regularly hit apartment buildings, supermarkets, cars, hospitals and schools. Some people have been wounded inside their homes. A 63-year-old man who gave his name only as Valery pointed to what used to be the brick wall of his apartment. "A shell came in this morning and there's no more apartment", he says. "My wife and my granddaughter had just come into the room. They were covered in brick and plaster." His 14-year-old granddaughter was taken to hospital with minor injuries and concussion. Although many residents gave the rebels money and some joined them when they first seized the city, some are clearly now fed up with the rebellion. Olga, the former advertising employee, said the rebels were drawing government fire on residential areas by placing their mortars among people's homes. She no longer saw them defending her from the Ukrainian authorities in Kiev. "It feels like the militiamen are crushing the city on purpose," she said. "We had a goal - we wanted to be independent. We helped the rebels. And now we don't see this goal, we just see chaos. This is anarchy and lawlessness." She sighed, thinking back to the last days of stability, before the now ousted, Moscow-backed Ukrainian president was challenged by the Kiev "Maidan" protests sparked by his rejection of a free trade deal with the EU. "I would go back to November 2013, so there would be no Maidan and we would not have all this here," she said, looking around her ruined city. "I would take my kids to school and go to work and we would live in peace". History of Eastern Europe is complex and has been speculated on for centuries, as well as manipulated. Today and for the past almost 400 years Moscovia is desperately trying to legitimize name Russia as its inheritance from Kiev's Russ. Name Russian becoming more and more associated with dictatorship and aggression. It is very unfortunate. Majority of people in Ukraine, Belarus and Russia my think of them self as descendants of Kiev's Russ but they can not say they are Russians due to the association with modern government in Russia, which got derailed in the process of stabilizing the country. As long as Russia is pretending to be an older brother of three ex-Soviet Slavic countries, Bossing around, there will be no peace and no understanding. If Russia want to keep three countries together as friendly neighbors, it must find different approach. When family gets together at the Holiday table every body are equal. If one of the brothers who is actually much younger but more fortunate will try to play the roll of an older brother, he will be shown where he belong.